Hatters chief Nathan Jones has been forced back to the drawing board after plans to bolster his squad fell through this week. 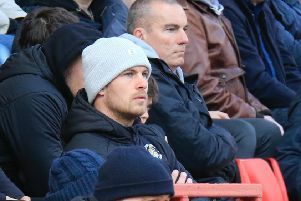 The Luton boss had said on Wednesday night that he was in negotiations with an un-named player, but speaking after today's 2-0 win over Notts County, he revealed that deal is now dead. When asked if there had been any movement on the transfer, Jones said: “There was, but it’s not good movement to be honest with you, it’s a bit frustrating, so we’re back to the drawing board as it is. “We invested a lot of time in the person we wanted to bring in, we weren’t able to get it over the line, so that’s disappointing, but we’ve got lots of good players here, so it’s not as if it’s the be all and end all. On why the deal collapsed, Jones continued: “I wouldn’t want to go into details and I wouldn’t want to put anyone in an awkward position in terms of anything, it wasn’t possible to do it in the timescale that we needed. However, with the transfer window shutting at 5pm on Friday, August 9, Jones is still hopeful of strengthening his squad, as he added: “We want to bring another one in, real competition. "Luke Berry’s close to being back, so that adds a little bit more, but with the window shutting and not being able to do anything, we might need another. “The one that we wanted to would have improved us significantly, we haven’t been able to do that, so we’ve got to make sure that first and foremost we get the right one and we’re endeavouring to do that."